This very handsome, large format edition of the Russian folktale has been issued to celebrate the 100th anniversary of Stravinsky’s ballet ‘The Firebird’. 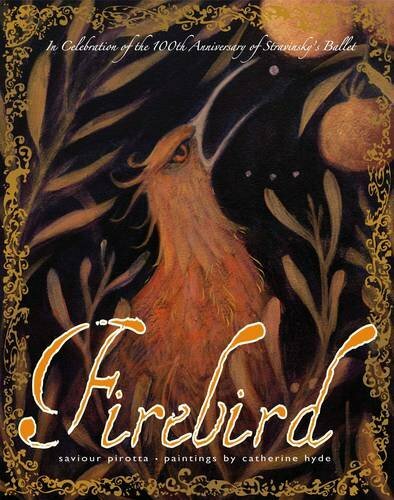 The retelling of the story of a youngest son who overcomes obstacles to capture the glorious firebird who has been stealing his royal father’s golden apples is beautifully recounted, and is brilliantly paired with artwork that makes this a very splendid volume indeed. Many of the motifs in the tale will be familiar to Anglophone readers, but the actual story of Ivan – a good role model as a tryer! – may not be so well known. As well as capturing the firebird, and subsequently setting her free, Ivan gains half his father’s kingdom, a beautiful princess who has fallen in love with him on first sight, and a good friend in the mysterious Grey Wolf. The pages are large and plenty of space is given to the painterly illustrations; these accompany the text rather than tell any of the story themselves, but are no less an integral part of the whole. And after all, ballet is a visual medium. Hyde’s artwork is loosely structured; her palette is quite dark, suggesting the nocturnal settings of many of the scenes, and in the last spectacular double spread, the firebird in her glory swoops across the pages.